To mark the close of 2014, we decided to have our Gratitude Circle linky up today. 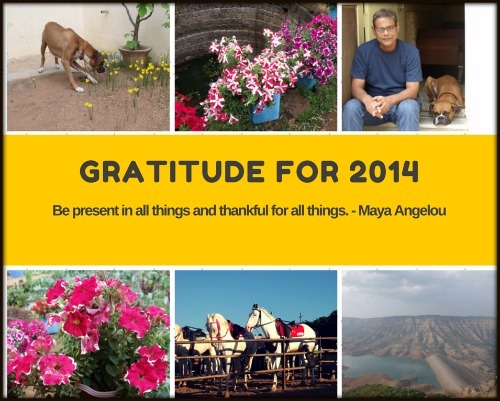 What better day than the last day of the year to look back in gratitude for all that has been. I also pledge to be present in all things and thankful for all things every day of 2015. I’m present and thankful today! For love expressed in every way. And all that things I’ve let annoy. And give thanks for recreation and rest. And give thanks 365 days through. I’ve kept my gratitude post simple today and invite you to join us in giving thanks for 2014 and be a part of our Gratitude Circle next year. Join Vidya Sury and me in writing a post every month and adding it to our linky that will be up on the 4th Thursday of every month. You are welcome too to join our Gratitude Circle on Facebook. Thank you for all you have been to me through 2014!